Transportation Costs > How Much Does Marine Grade Plywood Cost? How Much Does Marine Grade Plywood Cost? Marine grade plywood is a type of manufactured wood that has been treated to resist rotting in a high moisture environment. Due to its characteristics, marine plywood is a bit more expensive than standard plywood. Stronger than the conventional plywood which only has three layers, marine plywood can resist rotting, warping, shrinking and yes — even boiling water. Marine plywood will have more than five layers bound together with a waterproof adhesive to help repel moisture and bear heavier loads. As a result, the sheet will look similar to plywood but will be much stronger. The average price, depending on the thickness, the number of plys and dimensions, is anywhere from $45 to $215+ per sheet. A common unfinished 3/4″ x 4′ x 8′ AB marine plywood board, for example, can retail for about $70. To price it per square foot, it can be between $2 to $3 for the materials alone. We talked with some distributors online and were given the following quotes for sheets noted below in our table. This 4 x 8 3/4 CAT PS1-09 marine graded douglas fir sanded plywood at Lowe’s, for instance, retails for $75. DIY or Not says it can be much more than traditional plywood which can cost $10 to $50, as opposed to marine plywood that can cost $70 to $200 per sheet. Marine grade plywood is designed to be used in environments exposed to more moisture than traditional plywood. This plywood is commonly used for constructing boat docks, building boat decks or using it as a subfloor in a kitchen and/or bathroom. This plywood will be stronger on its exterior because it has a larger number of piles and twice as many as the exterior, which significantly improves the strength. Secondly, marine plywood has no voids, meaning the piles are continuous, allowing no air gaps to get in between the wood. This means no reservoirs can form to collect water. The average thickness can include 1/8″, 5/32″, 1/4″, 3/8″, 1/2″, 5/8″ and 3/4,” common sheet sizes will include 4′ x 8′, 4′ x 4′, 2′ x 8′, 2′ x 4′, 5′ x 10′ and 4′ x 16′. Ply sizes can either be 3, 5, 7, 9, 11 or 13. Unlike plywood, marine grade plywood may not be available at local lumber yards. If purchasing online, some shipping charges may apply if you don’t meet the retailer’s minimum order. Adding a varnish, paint or stain to the finished product can be an additional cost to consider. It’s highly recommended you use marine plywood if the designer specifies it. 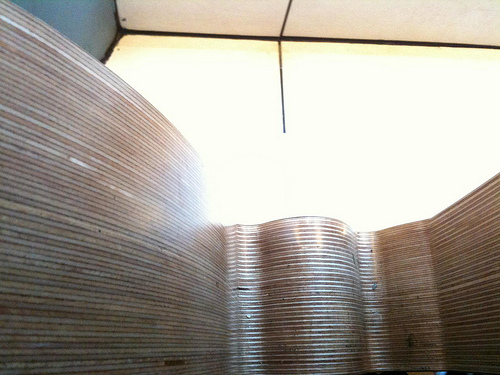 This plywood is known to be stronger and stiffer because of the number of piles. This plywood is very easy to work with since it will be very flat, sanded and can look good on most projects. It’s important to choose certified marine plywood for insurance purposes. If the marine plywood will be exposed to the sun, make sure it has a good primer on it in order to protect it. If possible, plan on using multiple coats to ensure that the sun doesn’t wear away the color as the sun can do damage over time. If the plywood is going to be exposed to the water, make sure that you use a marine-based paint to protect it. This plywood is extremely easy to work with, especially when finishing and bending it. A common myth online is that it’s not treated against rot. As far as rot goes, there’s nothing special about marine plywood. On the market, you can find both marine and rot treated wood. Boat Builder Central claims building a boat from marine grade plywood can increase the value of your boat. Marine grade won’t have voids and will be laminated with a resourcenol type glue, while pressure treated will have arsenic in it to protect it from bugs and rot to an extent; however, as the EPA got involved, most pressure treated wood won’t contain arsenic anymore. Regardless, the biggest difference between the two is the glue that holds it together. Marine grade plywood is made for its strength, while pressure treated wood won’t be waterproof. Those who used either or said if strength is your goal, consider marine grade, but if rot is the problem, consider pressure treated. Most pressure treated will be five plies, while marine plywood can be as high as 13. Try purchasing in bulk. Most retailers will offer a discount when more than 10 pieces at one time. Forum members on iBoats.com stated exterior plywood that’s properly sealed can work just as good.